Soak the chickpeas overninght atleast 8 hrs. cook chickpeas in pressure cooker till done. Allow it to cool. Put all all ingredients except oil and paprika powder in a food processor, Grind to a smooth paste. Transfer to a serving bowl. Pour olive oil & sprinkle with paprika or red hot pepper. You can add chopped tomatoes and olives. 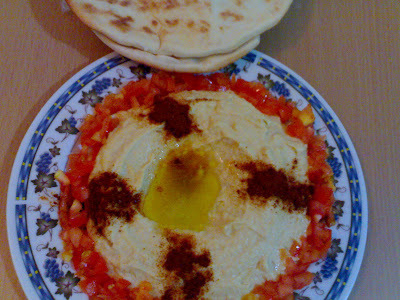 serve with pita bread. I have tried in restaurants never at home. Now I can try this too. Thanks for sharing the recipe dear. yes beena cook cheyyanam otherswise u can u can it from store. tahini u will get it from super market.